We refuelled and topped up water at Bowen. 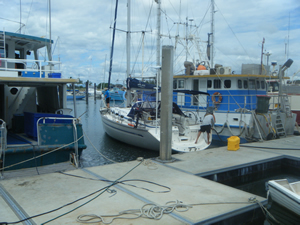 The fuel wharf was between two trawlers (see photo) so we needed a little shore help to squeeze in. Our filler cap didn’t match the huge thing they use for trawlers either so we had to trickle the fuel in which took about 40 minutes and gave the hordes of mosquitoes a leisurely lunch. While we did this, Isabelle went shopping. The wharf is owned by the local fish co-operative, (hence the trawlers) and other than that there are no shops for miles around. Non the less as we were about to take off Isabelle comes hurtling down the dock at her normal operating speed with shopping bags. Coral Trout, Red Emperor, prawns. Looks like a good lunch! Getting into the harbour wasn’t so hard, just make sure nothing is coming, give her heaps and Dreamagic came out from between the ships like a champagne cork from a warm bottle. We motored out of their tricky harbour and across the Gloucester passage to Gloucester Island. 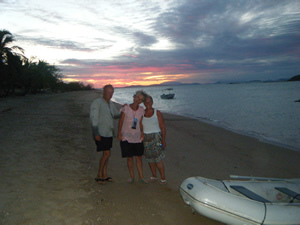 I have been to Montys Resort a few times so we chose the other side of the passage at Picnic Bay for an anchorage. The pilot Guide “100 Magic Miles” suggests we can anchor within 30 meters of the shore and there are freshwater streams and pools. We are about 200 metres from shore, with less than 2 metres under our keel at low tide. Non the less it is secure, the dinghy was launched, the outboard attached and while the crew went in search of the fresh water streams, I went to bed. The description of the brackish mangrove water that Mark and Isabelle found doesn’t seem to match the sparkling clear streams in the book. Mark also felt that they were crocodile infested which was curiously omitted by the author. Non the less we had prawns for lunch and a beautiful coral trout for dinner. The cooking of the trout was from an award winning receipe. Imply bring sea water to the boil, drop in the trout. The water will go off the boil. Leave it on the gas, when it comes back to the boil the trout is done. Sceptically, Isabelle tried this. It works! Perfect fish, just cooked. After dinner Mark suggested we go to the resort for dessert. The resort is about a km away across the channel so we piled into the duck and took off. Half way across I realised that we didn’t have any safety gear. No torch especially but we were committed anyway. The resort is a very low key affair. Indeed low key enough to only have three desserts, and one was off. We tucked into Passionfruit Cheesecake and Mudcake and then made our way back to the dinghy to launch for the 1 km trip home inn the dark. The wind had picked up by now and there was a short chop across the passage which gave us all a thorough soaking. That aside a successful trip back without being washed out to sea.